These 90 mm, felt-lined mounting rings are made out of solid aluminum, anodized in black or silver, and will fit most 90 mm OD tubes, and all William Optics 80 and 90mm telescopes (Megrez 80 and 90, ZenithStar 80). A worthwhile investment if you want the best out of your GEM or Alt-az mount. __® Supplied with five threaded holes (external imperial threading 1/4x20; internal M6 metric threading) for mounting on most dovetail plates and WO dovetail plate. __® Equally holed on top to fit additional accessories. __® Felt-lined to protect even the most delicate telescope finish. __® Very elegant, anodized black version ideal for ZenithStar scopes including the new ZS80IIED. __® Nice, comfortable knobs with teflon paint protection on locking end. __® 2 hexagonal metric M6 mounting screws provided. 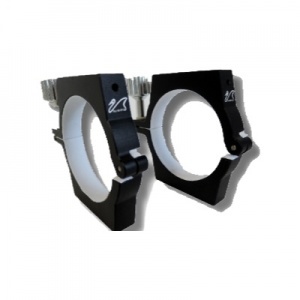 __® These solid rings will keep your telescope in perfect alignment. A telescope's pointing accuracy is only as good as the mount and rings it comes with: saving on rings is not always a wise choice!